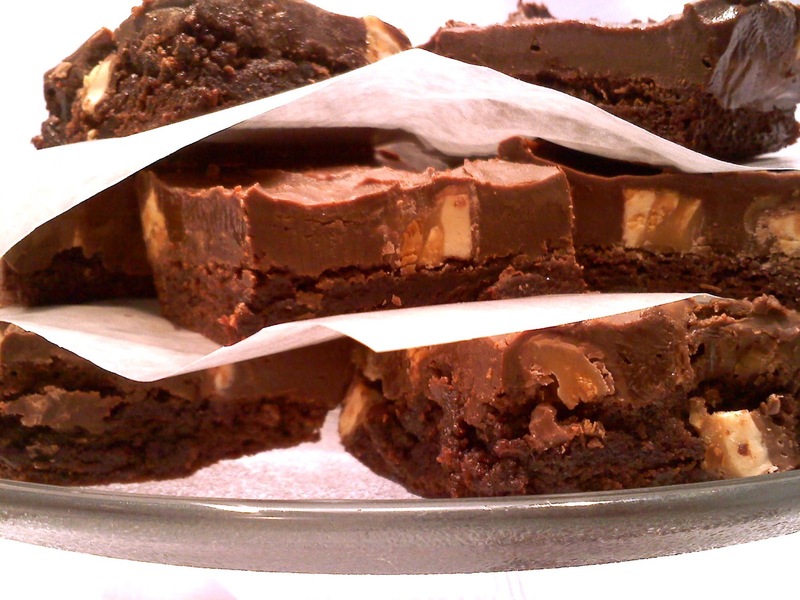 Brownies topped with fudge and chopped snickers! So, you know those moments when you're standing in your kitchen staring at random ingredients, wracking your brain because you just know you're on the brink of something awesome if you can just figure out how it all fits together? Kinda like when MacGyver uses a paper clip and a tampon to build a dune buggy to save the drowning sea otters and it totally works and everyone's like Way to go MacGyver! You're so rad! And sea otters are the cutest things EVER! No? Well, anyway... I found myself staring at a can of sweetened condensed milk, a bag of chocolate chips, some Snickers that I forgot to send with Brutus to his school party and a brownie mix and I thought... meh, why not? Y'all. These were SO easy and wicked good. So, the next time you want to totally rock it out MacGyver style, go for these. Line a 13x9 baking pan with aluminum foil and spray generously with cooking spray. Bake the brownies in prepared pan according to package directions for a 13x9 pan. Remove brownies from oven and cool for 10 minutes. Chop Snickers and sprinkle evenly on top of brownies. Make the fudge by melting sweetened condensed milk, chocolate chips and salt over medium-low heat, stirring until smooth. Spread fudge evenly over snickers (to spread mine evenly, I covered it with a sheet of waxed paper and pressed it with my hands). Refrigerate until firm then remove brownies from pan by lifting up aluminum foil lining. Cut to size then serve and store at room temperature. Sounds awesome! Can't wait to try it! SOUNDS DEVINE. YOUR BOOK SHOULD BE TITLED TASTES DEVINE. oh, yummy I will have to give these a try! Oh my - these jumped right out of the computer and grabbed me around the neck! =) MY Kind of recipe...we are so happy you linked up to Weekend Potluck, but would love to be able to feature recipes like this at FB...and WP...but I don't see a link back to WP. =( Please keep coming over for the party...we love having you. I made this right away and my kids devoured them! Thanks for sharing such a great recipe at the Weekend Potluck! Can't wait to see what you bring this week! OK I'm confused...do you bake the brownies with the Snickers on top or do you put the Snickers on after the brownies are baked? Thanks! After they've baked! I guess l need to edit that to read "bake" brownies instead of "make" brownies per manufacturers instructions. Can you ship some to me? Please help. I couldn't find the print recipe button. Sounds yummy! I'm going to make these for our girls weekend in Matagorda, TX.